KANSAS CITY, Mo. 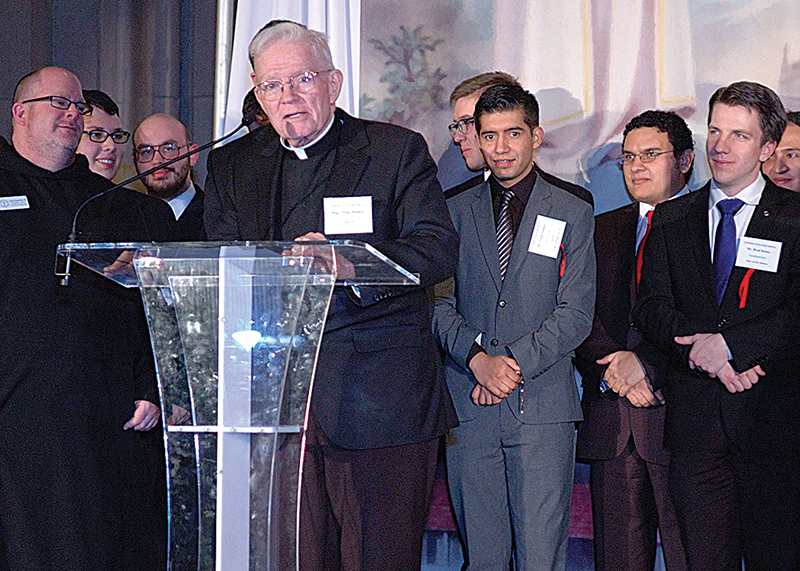 — One hundred was the magic number at the annual Support Our Seminarians (SOS) benefit dinner at Union Station here on Jan. 27. The evening, celebrating the 100th anniversary of Our Lady of Fatima, included a “marketplace” where many donated items were available for sale, along with delicious bakery products made at Conception Abbey in Conception, Missouri. Retired Kansas City newscaster Larry Moore, who has been the master of ceremonies for the annual event since its beginning, was on hand with his wife Ruth to announce their continued support for vocations. But he turned the master of ceremonies duties over to Curé of Ars, Leawood, parishioner and FOX 4 reporter Kathy Quinn. Quinn began the evening by introducing the chairs of this year’s benefit dinner — her brother, Donald Quinn, and his wife Mary. Archbishop Joseph F. Naumann and Bishop James V. Johnston Jr. of the Diocese of Kansas City-St. Joseph flew in from the March for Life in Washington, D.C., just in time to speak to the guests. “It’s been an amazing, inspiring day,” said Bishop Johnston referring to the march. “There were people as far as the eye could see. The bishop spoke with pride about the many seminarians at the march from both dioceses. “We have to provide the right encouragement for the seeds of faith to grow in these young men,” he said. Archbishop Naumann echoed that thanks. Abbot Benedict urged the audience to recognize that quality in young people and to guide them to consider religious vocations. Curé of Ars pastor Father Richard Storey gave a talk on Our Lady of Fatima — the theme for the evening. Seminarian Cruz Gallegos described his own discernment, recounting the time he spent in eucharistic adoration, as well as his devotion to the rosary and Our Lady of Guadalupe. He talked about the importance of supporting seminarians with prayers and financial contributions. “Because of you,” he said to the audience, “I and my brother seminarians are able to learn and pray in peace without worrying about finances. The seminarians took to the stage to a standing ovation as guests filled out donor cards. The proceeds from the evening support young men in formation for the priesthood in the Archdiocese of Kansas City in Kansas, the Diocese of Kansas City-St. Joseph and Conception Seminary College.